Email is a powerful way for businesses and services to communicate with their customers. From transaction notifications to billing statements to social media updates, email is a proven reliable and effective way for businesses to drive customer engagement and growth. However, unsecured email infrastructure is vulnerable to attack by bad actors around the world. In fact, the public Internet has become so hostile—and the threat models so varied—that only the world’s largest companies can deploy the technology and staff needed to maintain data center security while keeping up with the latest security methodologies. SparkPost is the first and only email API service to be awarded with SOC 2 Type II certification that covers all of its facilities, applications, and cloud services. Email security in the era of the cloud is a critical concern for business leaders. 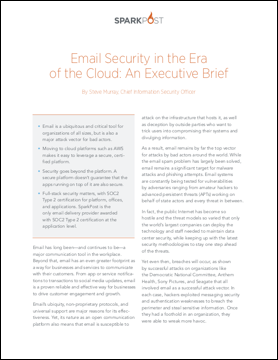 Download this executive brief to learn what you need to know about email security today.